My friend brought me this Yugoslavian finger fruit, and it was the first time I'd ever seen one. 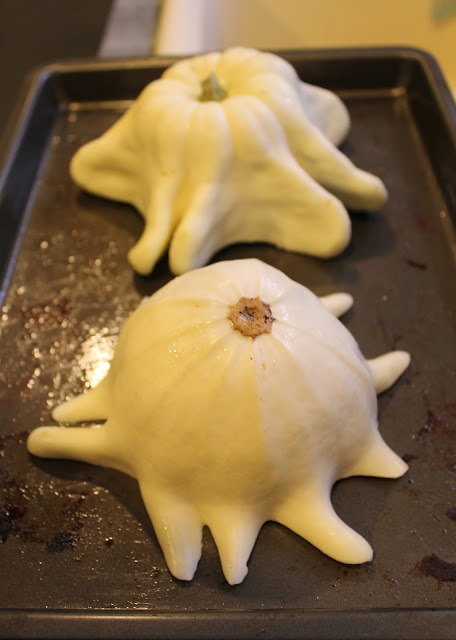 It's probably the coolest looking squash I've ever seen. placed the halves facedown on a pan, (the pan is dirty because I had just finished roasting vegetables on it), and baked it at 350 degrees F for around 30 minutes. Then I turned them face up and baked them for another 30 minutes or so until they were soft. After they had cooled, I scooped out the flesh and it was just enough for the cake recipe I used. In a small bowl mix the dry ingredients together and then drizzle the oil over, stirring together with fingers to resemble coarse crumbs. Then add in the chopped nuts. I combined all of the wet ingredients and then dumped all of the dry into the same bowl and stirred it all together with my trusty wooden spoon. None of this stirring in of half the flour and then stirring in the other half business. Poor into a greased pan and sprinkle the streusel on top. Bake at 350 degrees F for 45-50 minutes. This cake was SO good!! When I ate it for breakfast I called it "coffee cake." When I ate it for dessert I called it "cake," and when I ate it in between meals I called it "snack cake." It is a cake that can be eaten all day long!